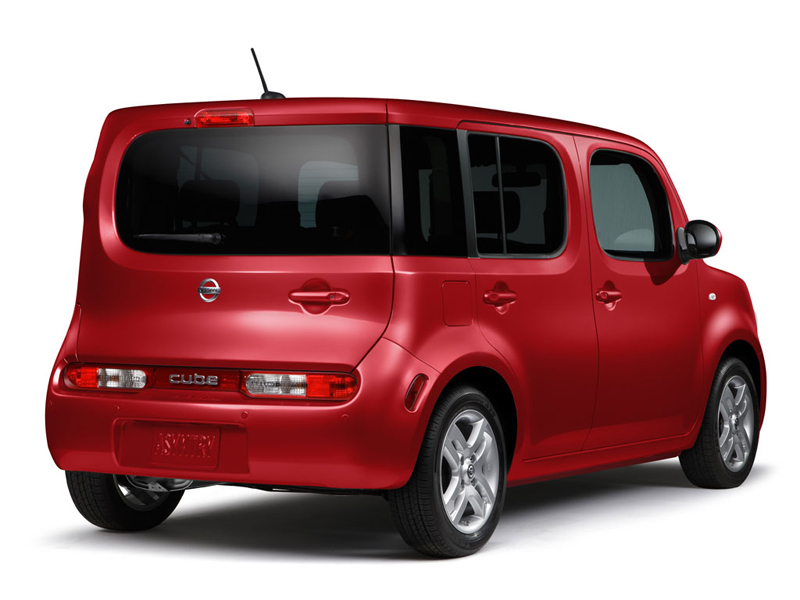 Nissan Cube – Its Cool To Be Square! I remember my 8 year old son coming home from school dead chuffed as he had won a gold star for a picture of a car he had drawn. Maybe if I had realised that the lad had a potential career in front of him as a car designer, his life would have turned out differently, but who could have imagined that 20 years later, his frankly awful picture would end up sitting on a showroom floor for us all to go out and buy. So this makes me wonder, how the Nissan Cube was designed. Is it that every young child sees cars in that way, or maybe the child sitting in the classroom beside my lad ended up working for Nissan and simply copied his picture? Who knows, but for sure, this is a strange looking vehicle, and one that Postman Pat would feel well at home in. They say the Cube is a cult vehicle and to be honest, I’ve never quite understood what that means, but it seems it applies to anything that’s either ugly, or exotic. Petrol heads would probably say that cult is the wrong word and these cars should really be referred to as “cool cars” as they are ‘offbeat, alternative and out of the ordinary” and if that’s the case, I guess the Nissan Cube is a cult car, as it fits that description, but cult’s can also be fad’s or crazes or maybe just a trend and you might think that’s what the future has planned for the Cube, however in Japan, it really is the car to be seen in, the ultimate fashion statement and who knows, maybe it will find its niche over here in the UK. Different seems to be the buzz word around the car industry as more and more cars seem to look the same and indeed, more and more of them share the same components even if they are different makes and as a consequence, the car makers are working hard to convince us their products are different. Even Volkswagens Golf TV advert compares other cars to the once iconic Golf saying things like “Its like a Golf, but not a Golf”, “double overhead cam, just like a Golf”, “handles like a Golf” and remarkably, they even say that shutting a cars door, sounds just like a Golf and there we have the nub of the problem, most cars are very similar and poor old VW are even trying to drum up some business by effectively saying their car now isn’t any different to anything else. Well that’s an argument that can’t be levelled against the Nissan Cube, it’s not like anything else and frankly, I can’t imagine that anyone else is going to make are car like the Cube. So let’s take a look at the history of the Cube and what you get for your money and as we have gone down the cult route, let’s tell you how we felt driving it. Fact is though, no matter what I say here, and no matter how good the Cube is, if you simply don’t like the look of it, you’re never going to buy one. The Cube has been around a long time now, first going on sale in Japan in 1998 and its now in its third evolution and since that time, its adventurous design and cheap domestic price has seen it become firmly established as one of Japan’s best selling cars. Nissan said they would never bring the car into the UK, so pretty much any of them you have seen on the road up until now, would have been privately imported, but that’s all changed and you can now grab one from a Nissan dealer near you. Externally, the Cube has to be the king of the box on wheels market, but fact is, it somehow transcends that as its fairly impressive in its own way, with its snub nose, widely spaced headlights and upright stance, which Nissan designers described as looking like a “bulldog wearing sunglasses” and that’s a pretty strange thing to say about your own car. We like the Cube’s odd asymmetrical rear door design, which results in you getting a rear side window on the passengers side, but not on the drivers side, allowing Nissan to have the rear door opening sideways (reportedly inspired by a 1950s refrigerator) as opposed to up on a conventional hatch and I suppose it provides more strength for the mounting of the heavy rear door, hence no window, but what ever the reason, we liked it, it’s a pretty cool feature that makes the car more interesting. Purists say its all about pure product design and the body has been made deliberately uncomplicated, to appeal to the iPod generation, but then, what do they know? On the inside, it’s fairly roomy with lots of headroom and comfortable seats and for the driver and front seat passenger; the lack of centre console makes it feel even more spacious (although the driver does get a seat mounted centre armrest they can fold down), but with the front seats pushed all the way back (not that you would need to do that), taller people might find they need a little more knee space. The rear seat can also be slid back and forwards to give either more room for stuff in your boot, or more room for your passengers (decisions, decisions). The seat backs are split and can recline independently also, which is a nice touch. The Cube isn’t just about quirky looks and styling, it’s actually very nice to drive and the chassis has a soft but well dampened feel about it, as I suppose it should, as it shares its platform with Renault, known for their “comfy motors”. The Cube uses electric power steering, which makes parking this 4mtr box an absolute breeze and whilst some critics bemoan electronic power steering as lacking feel, and whilst maybe that’s true on a performance car, we thought it suited the Cube perfectly and when added to its excellent 10.6 metre turning circle and super visibility, it makes the Cube a ideal city car that’s both comfortable and relaxing to drive. The Cube is available with two different engines, a 1.6 petrol and a 1.5DCi and a CVT version is available on petrol models. Prices go from £13,795 for the 1.6 lead in model and £14895 for the ‘Kaizen’ version with £1200 more if you want the CVT gearbox. Diesels start at £15,275 with the ‘Kaizen’ at £16375. There is also a special edition model called ‘LDN’ and that’s £14395 and again, it’s also available with CVT at plus £1200, but even the entry-level model comes well-equipped with air conditioning, large glass with “ambient” or solid blind, Bluetooth connectivity, 16-inch alloys, ESP, cruise control, CD player, so offers mega good value. In terms of fuel consumption, our car was the petrol 1.6CVT (automatic) and we found we could achieve over the claimed 40mpg combined average, although, if we drove it aggressively, that figure dropped considerably, more in the direction of the published urban figure of 32mpg, which to be fair isn’t that economic and added to that, our car had a CO2 emission of 159g/km which by today’s standards is also pretty high for a car of its size, although, don’t forget, our car was a petrol automatic and the manual has lower CO2 and a slightly better fuel consumption. So our message is, if you don’t need an automatic box, go for the superb 1.5DCi engine, as its going to deliver 47mpg+ in urban use, 60mpg+ in extra urban and a very credible combined average of 54.3mpg, whilst CO2 emissions are a well acceptable 135g/km. Please don’t think this is taking an unfair swipe at the Cube, but I drive lots of different cars while we have them on test, but the Cube takes the laurels for the car that has attracted the most Mickey taking comments and the most laughter, and in just a few short days, I got to know the words of the Postman Pat song pretty well. However, I consoled myself by believing they were the ignorant ones, the ones that believe the earth is still flat and that they lacked the vision to see the Cube for what it really is, which is a pretty decent car. Over in Japan, you can get the Cube in a stretched seven seat version, whilst the UK models currently just have five seats. I can see a justification for the car in seven seat version, although just putting five seats in such a roomy thing, kind of seems a waste. In closing, I enjoyed the Nissan Cube and indeed, I was excited when Nissan said they were sending us one to play with and the longer I drove it, the more I liked it and the more I wanted to defend its wacky appearance, so I guess it found a place in my heart and lets face it, if all else fails, it will always have a role at Christmas in pantomime, as it could get together with the Fiat Multipla and play Cinderella’s ugly sisters. I guess I can see where Nissan are coming from with the Cube, as most quirky, or should I say fashion conscious hatchbacks are small cars like the fiat 500 and Mini and whilst they are ok, they are pretty small and for fashionista’s who perhaps now have a family, the Cube gives them the opportunity to have bigger “family car” yet still make a statement, although for the life of me, I don’t know what it could be. Unfortunately, it seems that I also fell in line with the jokers over this car, but there is no denying, it’s a well put together, practical, fun to use car that’s nice to live with and of course, its made by Nissan, who in our eyes, can do very little wrong anyway. If you fancy a “bigger hatch” and if you don’t fancy the ubiquitous Golf, Focus or Astra, please put your dark sunglasses on, add a wig and a stick on moustache on and take a toddle down to you local Nissan dealer and you might just find the funky, inexpensive Nissan Cube puts a smile on your face and beguiles you into handing your cash over. For a quotation on the Nissan Cube, or on any other Nissan, please contact us.